Valentine's Day, friends and nail polish! Hello! It is Valentines' Day today. A strange day and it has made me think about the people I love and consider friends. A person I considered a close friend vanished from my life recently. I was so concerned that I considered reporting her as a missing person but then realised it would be a ridiculous thing to do. She was someone I'd only spoken to via the internet. Today she made contact and nothing she said makes any sense at all. I cannot fathom it and now I don't want to. So today I have used one of my favourite brands, Lynnderella, and chosen the polish called 'Do Not Drink'. I remember pink paraffin being available from garage forecourts when I was a kid and I am sure it had a warning label advising us not to drink it! I have failed to capture the majesty of this polish. It has a red finish crammed with magenta, violet and pink sparks. There is even a smattering of holographic sparkles too. This is blurry on purposes to try to capture the sparkles. It glows in real life but the camera needs to be out of focus to see the impact. You can see the blue/violet sparks here. 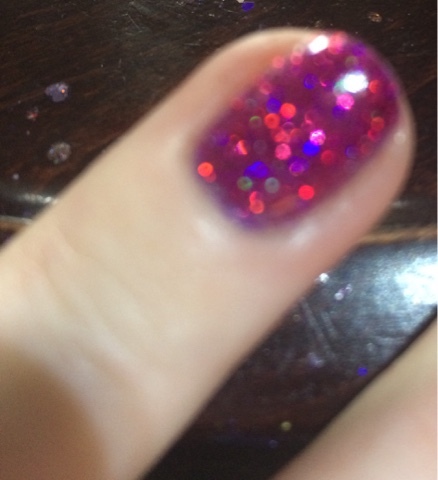 I painted two accent nails of the Lynnderella over a base of a CBL Oops purple holographic polish. If you are reading, then I'd love your comments, feedback is always appreciated. I am not a nail technician or a photographer! I do not claim to have fantastic nails. I simply own some fabulous polishes and have some fabulous friends who help me find them! I use an iPhone 5S to take my pictures. Enchanted Polish "Hot Chocolate for Unicorns" and Lynnderella "How Now Brown Holo"
Hello! Another post so soon! Today I decided upon a brown nail-job. 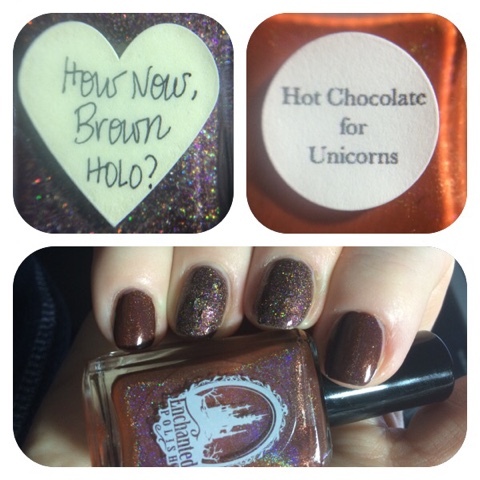 I painted a brown cream over all nails and then used Lynnderella "How Now Brown Holo" over the ring and middle nails and Enchanted Polish "Hot Chocolate for Unicorns" on the rest. 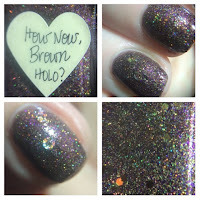 Both are superb polishes; the Lynn has pink and copper sparkles as well as holo twinkles and the EP is a mid brown creamy holo. I used two coats of each polish. 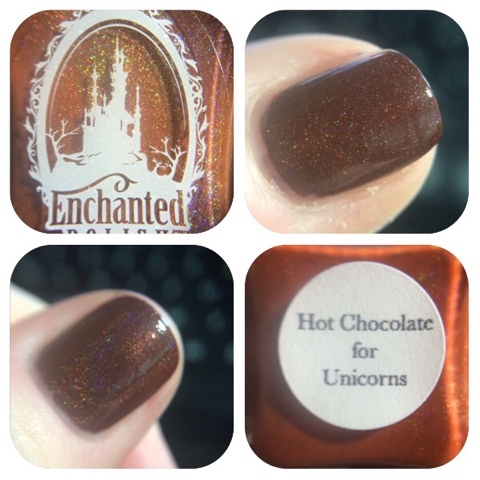 I used a top coat of Seche Vite over the Lynnderella as this one does dry to a matte finish. It is fairly smooth after one coat of SV but I may add another later to get the glass like finish I enjoy. The EP is a rich chocolate colour and looks better in real life to me than the picture suggests. It is a darker brown on the nail. I top-coated with Nails Inc 45 second Caviar top coat. It is gives a fab shiny finish to most polishes but I prefer it on creams or holographic finishes. Yesterday I was telling someone about using Dance Legend peel-off Glitter Base to stop staining. 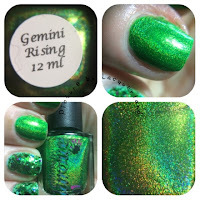 I had used the stainiest stainer of all my staining polishes (CBL Gemini Rising) and da da daaaaa! I have no staining to report! 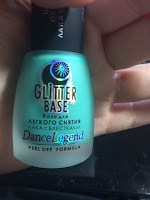 I used the DL Glitter Base in mint green. Now CBL Gemini Rising is the most wonderful green holo, so full of pigment, but it can leave nails with a parting gift when it is removed. Yellow nails. This is not really an issue when your nails are painted all the time but I get it. It isn't a good look. I painted the unusual mint green base and it leaves a polish that you could wear on its own. There are no streaks, it has a gel look to it when dry. It is a little thicker than normal base coats but this is not a normal base coat. 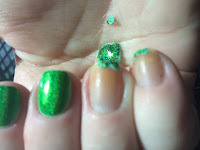 Then two coats of GR on most nails and a glitter on the others. When time comes to remove the polish, it is easy. 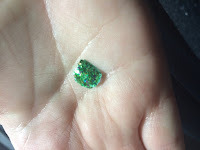 I find that glitter comes off much easier than holographic or creamy polishes. It is a matter of finding an edge and using an orange stick to ease it off. Mostly it peels in one or two chunks but sometimes it sticks to the free edge, For me, I can use the orange stick or polish remover to get this remaining bit to peel. 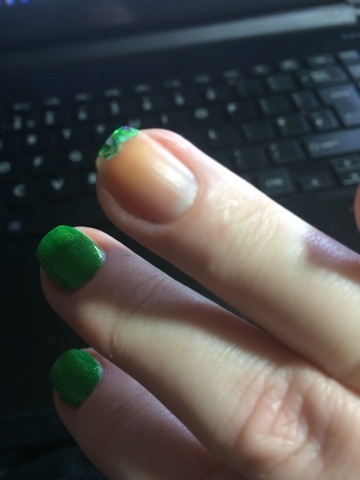 I have not noticed any damage to my nail plate.